Located in the heart of Manchester, Deansgate is a mile long stretch of road boasting landmark buildings and businesses, numerous bars, restaurants, clubs, hotels and more. At one end of the road you’ll find Manchester Cathedral and at the other sits the iconic Beetham Tower. The main route through Manchester City Centre, as you work your way along the street, you’ll also come across John Rylands Library and Spinningfields. Home to many celebrations and activities throughout the year, Deansgate is one of Manchester’s most lively districts with big expectations for the future so whether you’re looking for an unforgettable day out or want to call it home, Deansgate should definitely be top of your list. There’s something for everyone in Deansgate. From cool cocktail lounges, live music venues, comedy clubs, traditional pubs and more – whatever your style, age or budget you’re sure to fall in love with this little snippet of city culture. Catch up with friends in the Living Room, excite your taste buds at The Botanist and dance the night away at Impossible Bar. Relatively new to the area, Great Northern Warehouse is one of the most popular spots in Deansgate. Formerly an old railway warehouse, nowadays it is a modern leisure complex which consists of the famous burger joint – Almost Famous, a cinema, casino, bowling alley and indoor axe throwing! 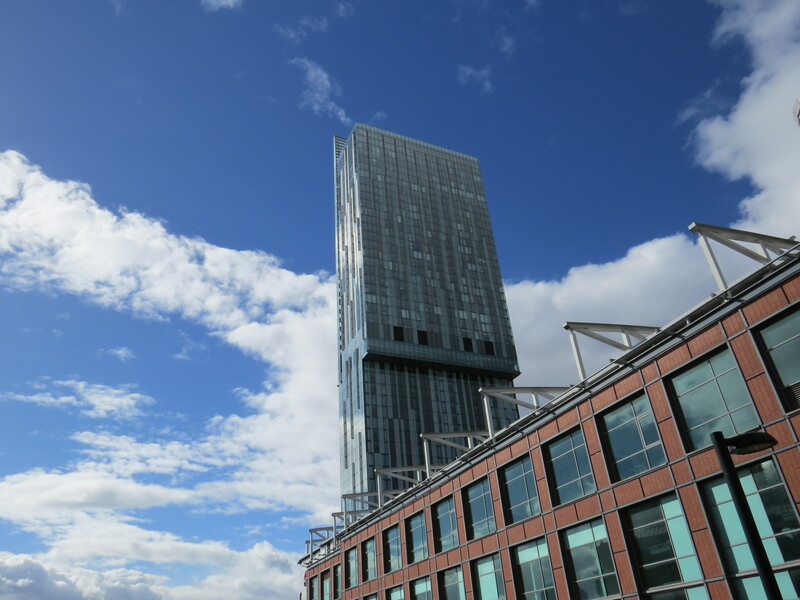 One of Manchester’s most iconic images – the Beetham Tower is a guaranteed talking point. Inside you’ll find the Hilton Hotel, Cloud 23 Bar and an exclusive spa – ideal for relaxing in after a long day in the city – working or playing. By the canal, you’ll find Deansgate Locks, a young and vibrant party favourite, home to multiple bars including Revolution. Atlas Bar, which sits opposite Deansgate Locks, is an award-winning establishment offering over 250 different gins and definitely worth a visit. Notorious for luxurious cocktail bars and even better restaurants, Spinningfields in Deansgate is home to the likes of the Alchemist and Australasia. Don’t forget to look out for the Maker’s Market during July and August – an annual affair offering everything from vintage photography to delicious treats. More people are living in Manchester City Centre than ever before – and with areas such as Deansgate, it’s no wonder why. Number One Deansgate is a uber swanky and modern apartment complex, overlooking the city centre and is also home to luxury department store, Harvey Nichols. Created and designed by architect Ian Simpson, the building was famously at the forefront of redevelopment project in 1996, following an IRA bomb. Down the road in Spinningfields, Bauhaus and Leftbank are just two of the favoured complexes, popular with footballers and soap stars. As with any city, green spaces can be hard to find. However, Deansgate is home to a number of communal spaces and gardens including Hardman Square. In addition to this, canal side walks along the River Irwell make it the perfect place for runners, dog-walkers and those who simply enjoy stretching their legs. Having recently adopted the Global Street Design Guide, streets in the northern city will soon put pedestrians and cyclists first. Mayor of Greater Manchester, Andy Burnham, believes that this will allow areas such as Deansgate to take control of their streets, once more. In addition to this, as you wander along Deansgate, you can’t help but notice that millions of pounds are being invested into brand-new developments including Allied London’s St John’s and The Great Northern Warehouse by Trilogy Real Estate. Plans have also been announced that will see Manchester’s skyline transformed. Easily accessible from most places in Manchester, a direct tram can be taken from Manchester Piccadilly to Deansgate Castlefield. What’s more, free shuttle buses also run and trains to the area are available from Oxford Road Station. Frequently topping polls for being the most liveable city, Deansgate is just one of the reasons that makes Manchester such a fantastic place. If you have any questions or are looking for a property in Deansgate, get in touch today.